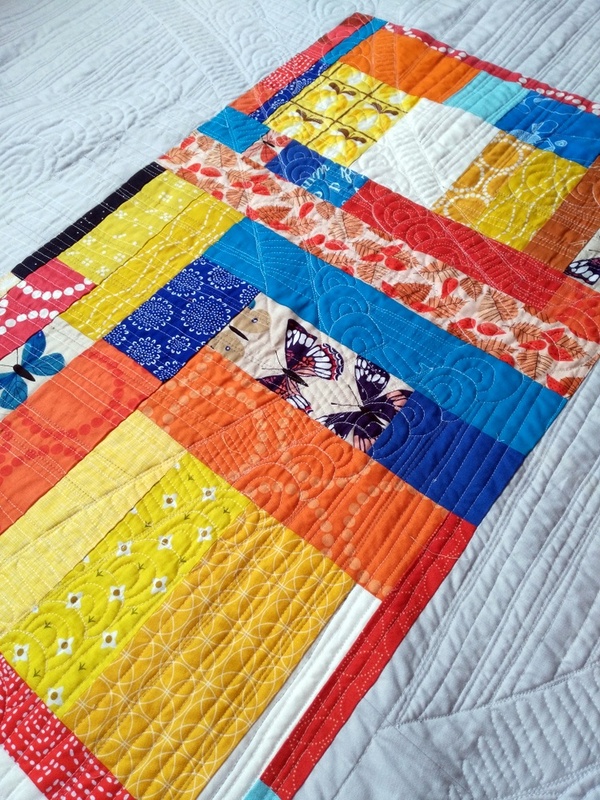 I used scraps from all the color blocks on the front to create one large, fabulous block. I hardly have any (more) scraps from this project! Plus, the quilting showed up SO great on the back. To continue the story from the first post, the back is a celebration of color and togetherness. Like all the people supporting me along my journey. Then, to blend with the light gray background, I created a smaller, ghost-like gray improv block to float below the large one. 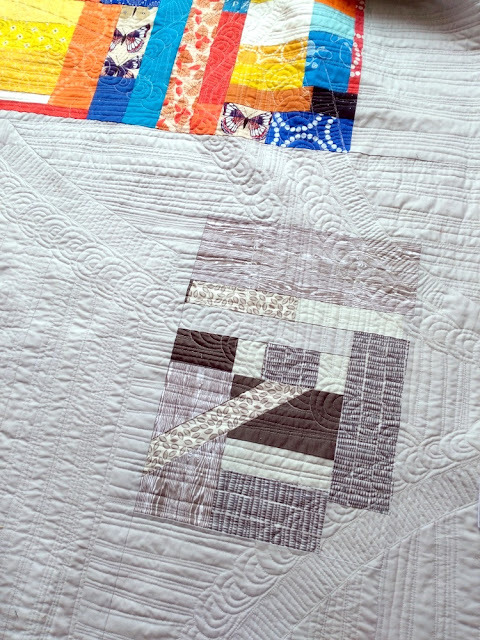 It contains the ONLY straight diagonal cut in the whole quilt (the front is all curves). I love that this block exists. It makes me believe that there's always something lurking helpfully behind the scenes that I don't know about. One more look. I'm still taken with the butterflies. I'm working on a longer blog post about pieced backings. If you'd like to be considered for publication on the blog, email me with a picture and let me know what you love about your backing. Thank you! I do love how the quilting shows up on the back. And the butterflies are so scrumptious! Pieced backs are such a pain to make but goodness gracious they can just be the icing and cherry on top of an otherwise fabulous quilt. Great job. I like this cool quilt. I like scrappy and artsy. I love each block. and the back is cool. Do you quilt all of your quilts on your domestic sewing apparatus? or what? I am so glad that you are going out and teaching others to pull out their creativity with sewing and making. 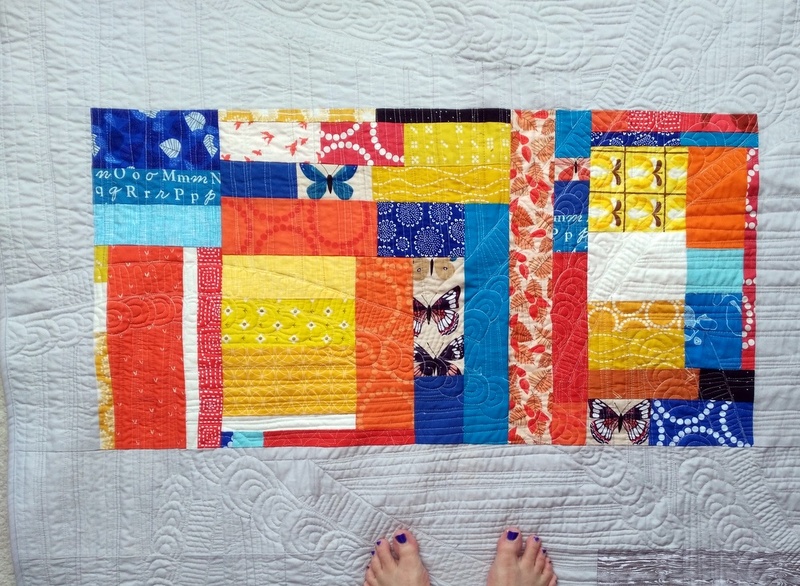 Such beautiful piecing and quilting, Jess! You are right the back is glorious - so glad you shared it. I love the idea of the ghost block! I love a good pieced backing. Yours is fabulous! One of the reasons that I love a pieced backing is that it's yet another way to use up some the fabric that's been hoarded for decades. Yes, really! I inherited my mom's fabric stash and created a large one of my own, so there's so much of it. But I love it all and decided that I'd find a way to use it. Pieced backings seem to be the answer! No more muslin backings for me, although it was all I used for many years. Your ghost block is divine! Seriously, it is. It has so much meaning and just looks extra cool. Your decision to use straight line quilting on it really speaks to me. In addition to the piecing on the back...it shows off the fabulous quilting!